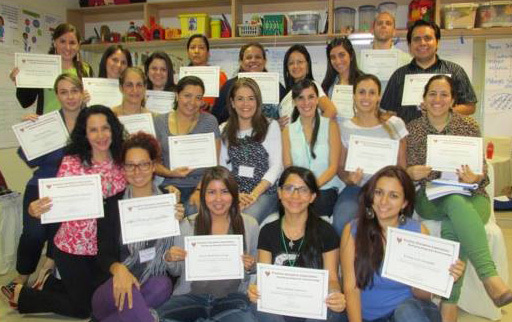 A Certified Positive Discipline Educator has successfully completed the intensive training in Teaching Parenting the Positive Discipline Way or Positive Discipline in the Classroom. In 2018 Positive Discipline for Early Childhood Educators was also added as an Educator Level Certification option. Upon completion, Educators are encouraged to teach parenting classes if they have chosen the Parent Educator track or use Positive Discipline in their classrooms if they have chosen the Classroom Educator track. Educators are also encouraged to become a part of the Positive Discipline Association in order to support the successful facilitation and use of Positive Discipline materials, deepen their understanding of theory and practice, and to enrich their use of Positive Discipline in their families or other work settings. With each Core Workshop, there is a free one year Positive Discipline Association Educator Level Membership offered. provide parenting classes, typically using the model of a seven week series or consolidating it into a 1 – 2 day program. may provide short seminars or introductory presentations on Positive Discipline parenting principles. who are licensed therapists or coaches may integrate basic PD concepts within the framework of their practice. use Positive Discipline in their own classrooms. may facilitate Teachers Helping Teachers Problem Solving Steps with their colleagues in their school setting or share about Positive Discipline in faculty meetings. use Positive Discipline in their own classrooms or early childhood setting. may facilitate the activities in the manual to train other Early Childhood professionals or parents of young children. Please note the Early Childhood Certification workshop can only be facilitated by a PDA Early Childhood Educator Certified Trainer. If you need assistance planning an appropriate training as a Certified Educator please contact the association at info@positivediscipline.org.